« Marian ‘Month of May’? ‘Pray the Rosary’? Are there plans by China, Russia, and some in Europe to dethrone the USA dollar as the world’s reserve currency? China dominates world trade. Her own economy is already significantly larger than that of the US on the purchasing power parity (PPP) estimates. While being the largest consumer of raw materials, China also exports more finished goods by value than any other country. As the Asian powerhouse, she has lifted the economies of all the countries on the western side of the Pacific Ocean, which including her own between them have a GDP of $50 trillion. Her exports into Asia now exceed her exports to the US. Yet despite this dominance, most of China’s trade is conducted in US dollars, something China is bound to change, if she is to contain external economic risk and replace America as the dominant global empire. Both objectives can only be achieved by China replacing the dollar as a medium of exchange. The alternative, with China announcing its true gold reserves and a rate of exchange with its own currency was always viewed as an extreme option, only to be resorted to upon severe provocation. But if China decides to revalue gold, western capital markets will be wholly unprepared for the fall-out. China itself will be affected, as will all other nations that trade with the US or trade with countries that trade with the US. The advanced welfare-driven nations dependent on capital markets are at risk. The great financial crisis of nine years ago will be a light rehearsal compared with what could follow. Much of the world wants to dethrone the USA dollar. The USA once had a gold-backed currency, but has not had one now for over four decades. The use of a gold-backed currency is seen by many as the means where those in Europe and Asia may be able to dethrone the dollar as the world’s primary reserve currency. In February 2017, Germany announced that it repatriated more of its gold three years ahead of schedule. Why would Germany do this? Are various nations accumulating gold with the intention to dethrone the US dollar as the world’s reserve currency? Will the US dollar ever collapse? Does the Bible teach that gold will have value after the currency of the USA is no more? Will gold deliver people in the end? What does the Bible teach? Here is a link to our video: Germany, Gold, and the US Dollar. 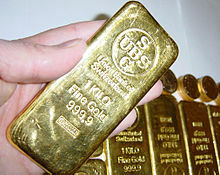 Germany has brought much of its gold back from storage in the USA and UK. But few in the Anglo-Saxon descended nations seem to care or consider the ramifications. There are reasons and consequences. The Bible talks a fair amount about gold. The NKJV has the word gold 451 times and the word golden 38 times. Gold is mentioned in the first and last books of the Bible. Prophetically, the Bible shows that gold will have value into at least the first few couple of years of the Great Tribulation–and that the Europeans and those that trade with Europe will also value it. There are no similar statements in the Bible backing up the future value of paper items, like the US dollar or the British pound (scripture, indirectly, teaches their elimination, for details see Anglo – America in Prophecy & the Lost Tribes of Israel). Daniel 11:24 shows that the leader mentioned in Daniel 11:43 will somehow also be accumulating wealth prior to this time, and that may involve gold accumulation. Perhaps to back up a European supported currency, he also may end up with personal and/or national gold reserves and/or wealth from the Vatican. The Vatican has a vast amount of wealth and is prophesied to be improperly involved with the kings of the earth in the end times per Revelation 17. Jesus told of the final time of the Gentiles (Luke 21:20-24). Essentially, this would be a rising up of continental Europe and Asia, but also with economic benefits to those in Africa and Latin America as well. The Bible is clear that a leader in Europe will be interested in gold in the end times. Gold will have value when the USA dollar becomes worthless. Now this does NOT mean that gold will only go up in value. It will have ups and downs and probably will drop in value once associated with the temporary peace deal that Daniel 9:27 alludes to (see also The ‘Peace Deal’ of Daniel 9:27). When I last checked, gold had dropped in value today. Unless there is national repentance across the USA, the USA dollar will ultimately be worth less than the cotton-paper it is printed on. US political leaders will be unable to stop it. Unlike the USA dollar, gold seems to be prophesied to retain value past the time the USA is gone (cf. Daniel 11:43; Revelation 18)–though it too will end up with issues and one day be worthless (Ezekiel 7: 19). Nations around the world are looking to gold and other means to dethrone the USA dollar. And it will happen as the Bible shows that the highly indebted nation at the end will face disastrous consequences (cf. Habakkuk 2:2-8). This entry was posted on Thursday, May 4th, 2017 at 7:00 am	and is filed under Prophecy.